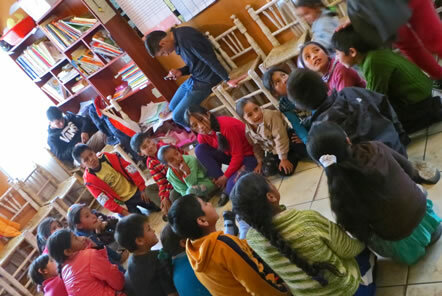 Gemma has recently travelled to Peru and visited our Community Education volunteer project in Huaraz. 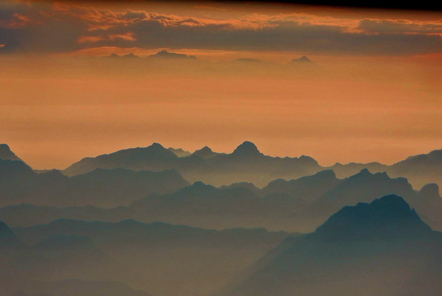 The day started with an incredible flight from Lima over the snow topped mountains which were glowing with the 6am sunrise. The small propeller plane arrived into Anta airport which has a stunning backdrop of the highest mountain in Peru which said to be the famous Paramount Pictures Hollywood film studio logo! 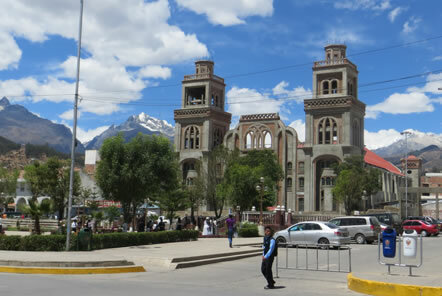 Yuri the project Director met me at the airport and we travelled for 20 minutes through mountain villages which were starting to wake up, before arriving in the colourful city of Huaraz. I met Alanna the lovely volunteer coordinator in the volunteer apartment, which is in the heart of the city. It’s a short walk from some beautiful squares, almost complete new cathedral, a range of restaurants and many shops. Half the city is wrapped in snow topped mountains, which look so perfect that it could be a movie backdrop! 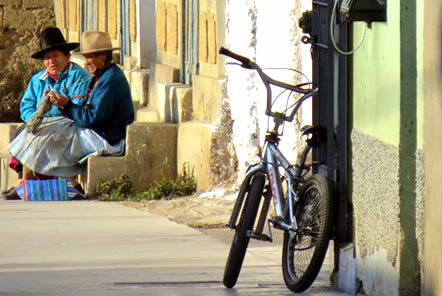 This was my first time in South America and I was surprised by the colourful streets and range of shops and restaurants in the city. In the morning, we walked 10 minutes to the Community Education project where the first session starts at 9 am. The older children who are aged 12-18 come to the project for help with their studies, to get a nutritious lunch and social support. It’s a great space for them to concentrate on their studies as many of the children come from cramped houses where there is no space or support for their education, many of their parents are also illiterate. I helped one of the oldest students decorate a display for her school exhibition for her social studies class. One of the youngest students, Carlos, needed help with getting his head around multiplying fractions, so the next hour was taken up by writing out and talking through many examples until the penny finally dropped and he successfully answered a sum with no help! I have very little Spanish (I know numbers, "my name is" and the standard greetings!) but I had completely forgotten my GCSE colours so one of the girls Sofia taught be 14 colours, after 30 minutes I had picked up only 50% of them before she gave up on her new student (which I don’t blame her for doing!) so we just spend the rest of the morning colouring with the odd quick quiz of colours as we went. I spent my first lunch in Peru in a traditional Peruvian restaurant with Yuri and Alanna eating ceviche (raw fish in lime with seaweed) and traditional chocho beans , which was a delicious way to start by trip in Peru. 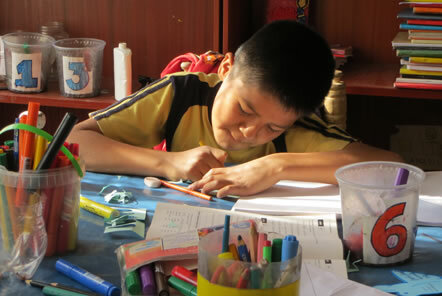 In the afternoon we helped the younger children work their way through their homework and test them on the subjects they had learnt in the morning at school. 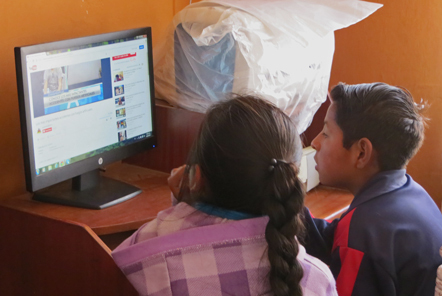 The Community Education project has recently been donated a computer so the children watched brilliant educational videos on you tube on the dangers of fireworks, fire and natural gas! It was Ben, one of the volunteers final night so we headed out in the evening to a local Peruvian restaurant where friend cheese and guacamole was a must-have starter so I followed with the “light” local soup (which has served in a huge porcelain pot and full of potatoes, cheese and eggs). On the way home we headed to a pharmacy to try out 'chuchuhuasi', the local traditional medicinal alcoholic hot drink made from a tree bark, honey and lemon and served hot. It was delicious and quite an experience buying from a pharmacy and drinking outside on the street at night! It is drunk to cure a huge range of alignments from headaches to stomach upsets. The next morning we headed out into the fresh mountain air (which is very thin due to the altitude, so I got a bit out of breath simply walking up the stairs!) and went to the market to buy food for the kids. Many of the children do not have full meals at home since their families struggle to make enough money to feed the whole family so for many of the children, the meal at the centre is their only full nutritious meal each day. Each Friday the children are treated to chicken burgers and a hot protein rich bean drink. The children are also taught hygiene and wash their hands before each meal and each have their own toothbrush which they use after each meal. It was great to work alongside volunteers from the US, UK and Holland. The market was quite an experience, so much colour and fresh produce (including Guinea-pigs!). The children come from very difficult backgrounds, two siblings currently live under a bridge since their home had recently collapsed but the local team have done an amazing job fundraising to build their family a new safe and secure home which is almost complete. Whilst I was there, it was one of the volunteer’s birthdays and so after ensuring all the kids had finished their homework we played games, sung songs and happy birthday. In the afternoon with the smaller children we played party games including duck duck goose, pin the tail on the lama, pass the balloon and Simon says. The kids loved the games and the birthday treat of cake. Walking back to the volunteer accommodation I was still amazed at the snow topped mountains which surround half of the city. I don’t think I would ever tire of the view! I was sad to be leaving Huaraz as I had such a lovely time and felt at home already but excited for the next part of my trip, off to Cusco to join our Amazon Conservation project!